Commercial astronaut training company Waypoint 2 Space wants to train people to fly into space for a variety of missions. Image uploaded Jan. 29, 2014. Do you want to fly on a suborbital space plane? What about a rocket launch all they way into orbit? A new commercial spaceflight training company wants to help you develop the right stuff for flying to space. Waypoint 2 Space — a Houston-based company aimed at helping commercial astronauts train for spaceflight — just received Federal Aviation Administration safety approval for their plan to train would-be astronauts. Officials with the company hope to start training commercial spaceflyers for private trips to space in spring of this year. People holding tickets aboard a private spacecraft or space fans interested in learning how to fly to space are eligible to purchase a training package. Spaceflight training doesn't exactly come cheap. Waypoint 2 Space's one-week "spaceflight fundamentals" program costs $45,000 and the company is currently offering 300 slots for people who want to train in the program starting in April. Full trips to space on Virgin Galactic's SpaceShipTwo, for comparison, sell for $250,000 a ticket. The Zero Gravity Corporation, meanwhile, offers weightless trips on a modified jet for abotu $5,000 per trip. 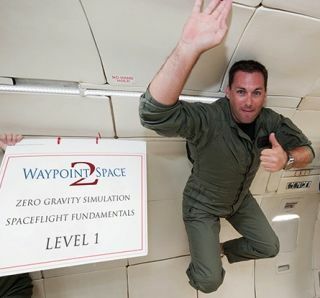 The spaceflight fundamentals program is one of three commercial spaceflight training options offered by Waypoint 2 Space. The fundamental program is designed to give participants a taste of what spaceflight is like. It is expected to take people through g-force training, a history of spaceflight, microgravity training and other kinds of courses needed for flying to space. The company is also offering specific suborbital training for flights aboard a space plane — like Virgin Galactic's SpaceShipTwo. However, registration is only available for service providers to reserve spots. The third Waypoint 2 Space program is aimed at orbital spaceflights and will not begin until 2015. Officials with the company are taking wait list reservations to begin training next year. "The Waypoint 2 Space team is a strategic mix of individuals who have developed training programs for both NASA astronauts and Air Force pilots," Kelly Soich, director of programs and chief payload specialist for Waypoint 2 Space said in a statement. "Waypoint 2 Space training programs incorporate the best techniques and technologies from NASA and Air Force programs while the FAA safety approval allows us to move forward with offering training classes and bringing the programs to the public. We are excited to be leading this effort and look forward to bringing the reality of spaceflight to our trainees."